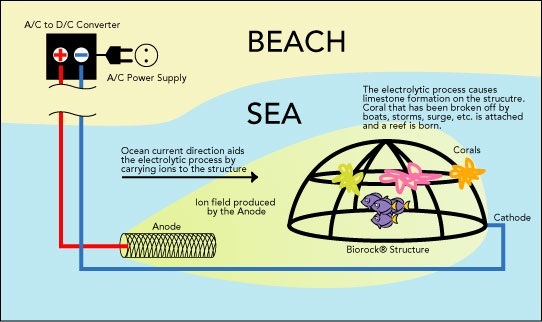 Biorock is a technology that uses safe and very low voltage of electrical ‘trickle’ charges that enhances the growth of corals on man-made structures at any scale. It also promotes rapid development and restoration of marine ecosystems. This technology is used successfully in many places around the world. The Fisheries Division of the Ministry of Agriculture, Lands, Forestry, Fisheries & the Environment, through the ‘Ridge to Reef’ project, recently invited the inventor of Biorock, Dr Thomas Goreau, to Grenada to assess and evaluate potential sites for the installation of Biorock reef structures. Dr Goreau visited and dove at four different locations, including Carriacou, and was very confident about the suitability of some of the sites seen, as well as the success of Biorock in restoring some of our degraded reefs. The first Biorock pilot program is expected to commence later this year through the Ridge to Reef project. Meanwhile, the Ridge to Reef Project recently recruited a Coral Nursery Coordinator, and will soon embark on a national coral nursery program that will be implemented by the Fisheries Division. 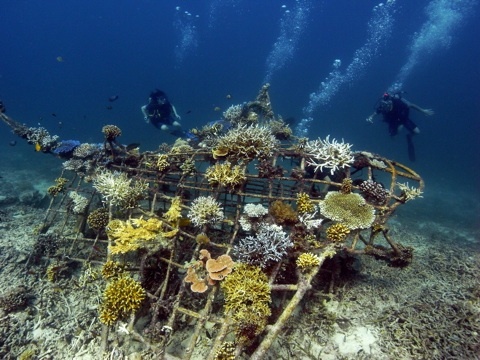 Coral nurseries will be established in all marine protected areas through this program. Community volunteers will be trained to care for and maintain the nurseries and coral gardens at each site. Grenada’s coral reefs have suffered significant damages from a combination of diseases, land-based nutrient runoff, storm damage, climate change, over-fishing, and direct physical damage. Our coral reefs provide significant ecosystem services and coastal protection throughout the tri-island state. Restoration of degraded reefs and coastal habitats on a scale that makes a difference, is an active environmental priority of the Fisheries Division of the Ministry of Agriculture, Lands, Forestry, Fisheries & the Environment.